"If we get this done, biggest ransom in the history of the world, my friend." 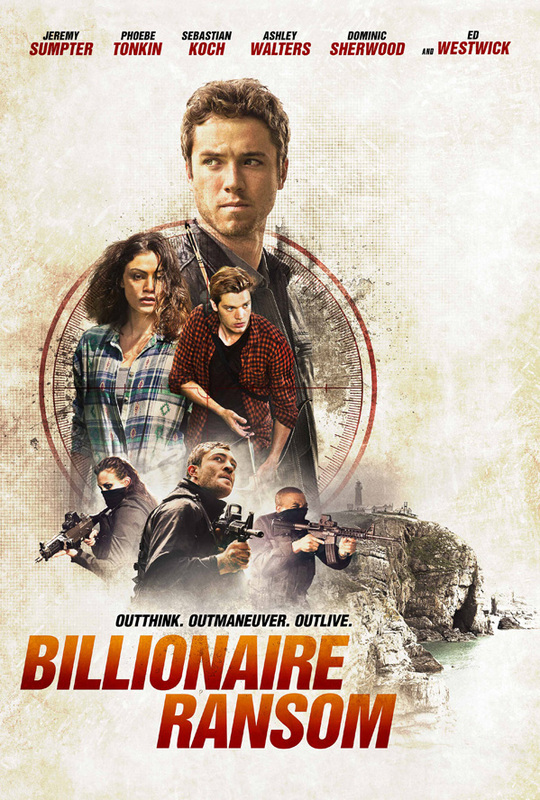 Gravitas Ventures has unveiled a trailer for a film called Billionaire Ransom, an interesting action thriller of sorts. The story is about a group of kids from rich families at a boarding school on an island who take matters into their own hands when the campus is taken hostage by criminals. The cast includes Jeremy Sumpter, Phoebe Tonkin, Ed Westwick, Dominic Sherwood, Elliot Knight, Sebastian Koch, and Sara Stewart. Not really sure what to make of this, some weird scenes in this trailer, but maybe it has some intriguing twists and turns. Then again, this seems like it could straight-to-DVD and it would matter either. It's made by the director of I Know What You Did Last Summer who hasn't really made much else since that film hit in 1997. See below. Follows a group of over-privileged, out-of-control young adults who have been sent by their frustrated, billionaire parents to a tough-love wilderness school on a remote island off the coast of Scotland. Kyle (Sumpter) and Amy (Tonkin) find themselves in this group as a last opportunity for them to take responsibility for their own lives and abandon their reckless ways, or risk being disinherited. Suddenly, a group of mercenaries led by Billy Speck (Westwick) invade the island and hold the privileged lot hostage for the largest ransom in history: one billion dollars. When Kyle learns they are all to be killed even if the ransom is paid, their wilderness survival training is the only hope of outwitting the mercenaries and staying alive. Billionaire Ransom is directed by filmmaker Jim Gillespie (Venom, I Know What You Did Last Summer), from a screenplay by Alexander Ignon. Opens in theaters + on VOD starting August 19th. Oh wow... This looks even worse than I thought it would. Let me clarify. I am not interested in this film. It looks very predictable and hard to empathize with the protagonists. DUMB. But that duster coat is going to be pretty sweet. Calling it now, the people that "kidnap" them are in on it and it's all a ploy for the kids to learn survival skills.